Dr. Maithel is a board certified surgeon and surgical oncologist with special interest in hepatobiliary malignancies such as liver cancer as well as cancer of the pancreas, stomach, colon, and small intestine. A specialist in liver, biliary tract and pancreas surgery, Dr. Maithel's surgical expertise includes the Whipple procedure, or pancreaticoduodenectomy, and minimally invasive laparoscopic pancreatectomy. 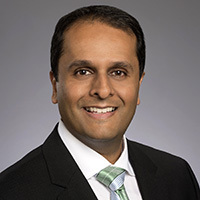 Shishir K. Maithel, MD, FACS, is Professor in the Division of Surgical Oncology, Department of Surgery of Emory University School of Medicine. A board certified surgeon, Dr. Maithel is an expert in hepatopancreatobiliary (HPB) surgery including the Whipple procedure, or pancreaticoduodenectomy, and minimally invasive laparoscopic pancreatectomy. His clinical interests include surgical treatment of hepatobiliary tumors, or cancer of the liver (metastatic and primary) and bile ducts, and other gastrointestinal malignancies such as cancer of the pancreas, stomach, colon and small intestine. He joined Emory Healthcare in 2009. Dr. Maithel provided the medical direction and voice-over narration for the "Surgical Anatomy of the Liver" iPad app which is used to teach surgical liver anatomy to trainees nationally and internationally. As chair of the Gastrointestinal Surgery Working Group of the Eastern Cooperative Oncology Group and the American College of Radiology Imaging Network Cancer Research Group, Dr. Maithel evaluates the production of forward-looking clinical trials that focus on biomarker-driven cancer investigations. His appointment to the Executive Committee of the International Cholangiocarcinoma Research Network allows him to oversee the global collaborations of renowned research groups that are working to improve knowledge about cholangiocarcinoma. He also serves as co-chair of the Adjuvant Therapy for Biliary Tract Cancers Expert Panel of the American Society of Clinical Oncology's (ASCO) Clinical Practice Guidelines Committee. Dr. Maithel is a member of the Discovery and Developmental Therapeutics Research Program at Winship Cancer Institute. He also holds memberships with American College of Surgeons, Society for Surgery of the Alimentary Tract, Americas Hepato-Pancreato-Biliary Association, Society of Surgical Oncology and Surgical Biology Club II. Dr. Maithel earned his medical degree at the University of Chicago, Pritzker School of Medicine graduating Alpha Omega Alpha. He completed his internship and residency at Beth Israel Deaconess Medical Center of Harvard Medical School. Before joining Emory, Dr. Maithel completed a fellowship in both surgical oncology and hepatopancreatobiliary surgery at Memorial Sloan-Kettering Cancer Center in New York. Dr. Maithel has a variety of research interests. He has worked in clinical investigation and outcomes analysis of patients treated for tumors of the liver, biliary tract, pancreas, and stomach. He also leads the translational research program in the Division of Surgical Oncology that focuses on identifying tumor specific molecular biomarkers as predictors of outcome and chemotherapeutic response for tumors of the liver, biliary tract, pancreas, and stomach (including colorectal liver metastases and pancreas cancer). Dr. Maithel is also the principal investigator on a novel protocol testing the benefit of giving two chemotherapy drugs instead of one after complete resection of pancreatic cancer and is a member and leader of three multi-institutional research consortiums that study tumors of the liver, biliary tract, pancreas, and stomach. He also leads the active research program in the Division of Surgical Oncology aimed at training post-graduate research fellows. Dr. Maithel has authored or coauthored over 150 publications and in addition, he serves on the editorial board of the Journal of Surgical Oncology and Annals of Surgical Oncology. Dr. Maithel has received numerous awards including the Medical Student Research Award and the Department of Surgery Medical Student Award from the University of Chicago as well as the Outstanding Resident Teaching Award and First Place in the Annual Residents' Research Competition from Harvard Medical School. In 2015, he received the Junior Resident Teaching Award from Emory University. He is an alumni member of Alpha Omega Alpha Honorary Medical Society.